A rather large group of documents from Malta was on Ebay in the past weeks and amongst these this nice document bearing a neatly cancelled GV 2/- large keyplate.It is the very first revenue document from Malta bearing any large keyplate used fiscally and in this case it was used to pay the stamp duty (corresponding to italian Lire 3,80) on a sale of Italian public debt in 1919. Is this the only UNIQUE KGVI large “Nyasaland” keyplate stamp??….. 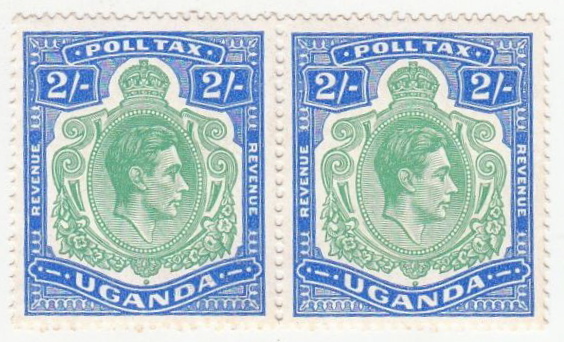 Uganda Poll Tax stamps are already very rare and until now I had never seen a copy of the five shillings top value.In his book about the GVI Large Keyplates,Eric Yendall provides pictures of all the stamps listed…..except of this value! You can imagine my excitement when I came across this one.This particular stamp has a very interesting story as well,it was found by an Australian philatelist amongst the collection of his grandfather Ignatius Sequeira who worked for the British as an officer in Kenya and was also a stamp collector.His family had a coffee plantation in Kisumu,Uganda and one of his cousins worked as a customs officer.I don’t know exactly how they got hold of this stamp,as all the Poll Tax cards,to which the stamps had to be affixed,were supposed to be destroyed after being handed over to the tax department officer.Enjoy!! 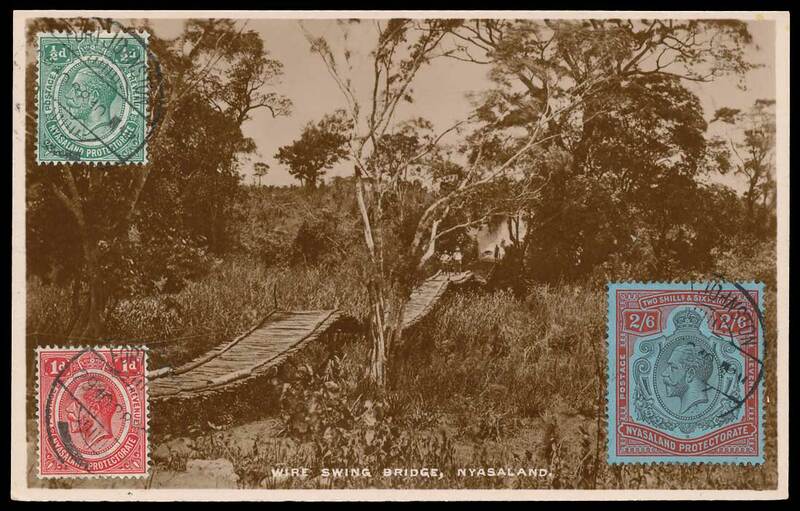 This I found browsing on web….nowadays similar wire swing bridges are to be found in adventure parks but back in 1928 these were not unusual in colonial Africa.Large keyplates were used for high value stamps making their use on postcards very difficult.This one was sent from Fort Johnston to Belgium.Wonder if there are any lions hiding under the bridge waiting for that lonely traveller…….! And here is the 2/- !! This pair just surfaced the market,a very lucky Ebay seller found it in an old album of mixed Commonwealth stamps.Apart this mint pair,two or three unused copies exist and one stamp is recorded postally used on a philatelically inspired cover to the UK. Proof material from this issue is very rare,no essays are known,only two frame proofs of the 1/- and 2/- are believed to exist with one of each in private hands and the other ones in the British Library Philatelic collections (Ex CA archive). 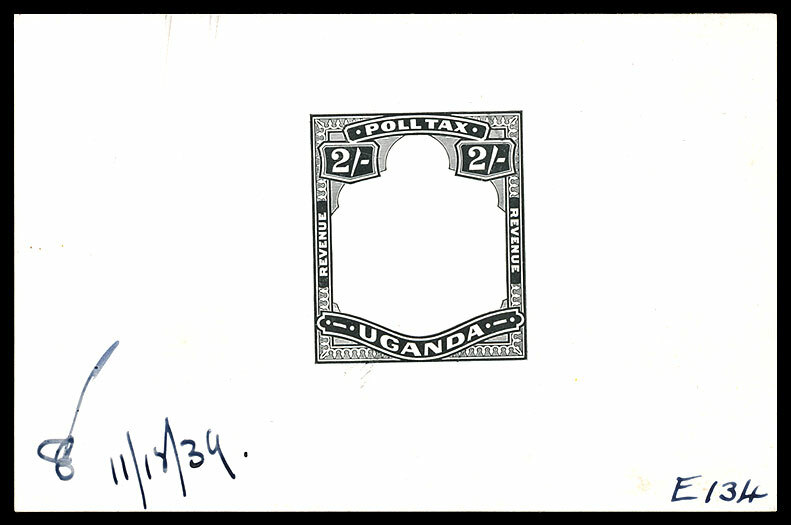 Only two copies of the Uganda One Shilling have been recorded,this one was recently sold by Spink and was one of the highlights of their November Revenue only sale.Why they are so rare it is not known,their Kenya and Tanganyika “KODI” (Poll Tax in Swahili) counterparts are scarce but can be found both mint,used and attached to their original tax cards.Kodi and Poll Tax stamps were printed in millions but were destroyed after that the taxpayer handed them to the tax department as a proof of payment.Two shillings Poll Tax stamps also exist (very rare) and we know from the printer’s archives that a Five shilling was also produced but no surviving copy has yet been found.Better start checking all those unsorted old stamp boxes as this 1/- stamp was sold for 1680 GBP’s!! 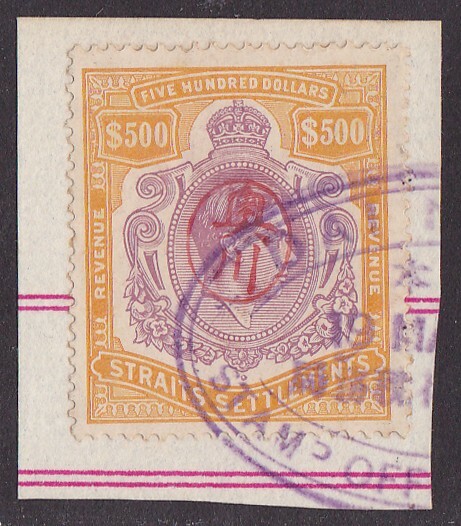 Wartime Japanese handstamp on the Straits Settlements GVI $500!! Bloody technology! 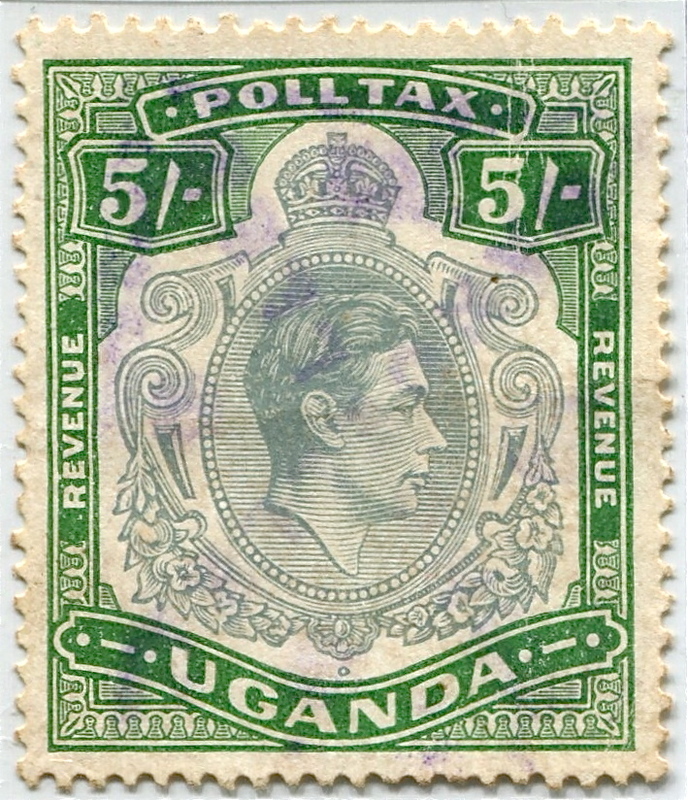 I wanted to post the pictures of the Uganda Poll Tax stamps but something is not working on my computer and it only allows me to post old pictures I had saved in WordPress for future posts.One of the stamps I had planned to show is the Straits Settlements GVI $500 with a Japanese occupation overprint.Only three copies have been so far recorded,one was recently sold at auction together with the also very rare $25 and $100 stamps.Singapore was occupied by the Japanese forces in 1942 and all postage and revenue stamps had to be handstamped with the personal seal of the Government Accountant for the Japanese authorities Mr. Akira Okugawa.The high value revenue stamps were individually handstamped since very few were required during the occupation period.It is believed that only a part-sheet for each value received the Okugawa seal.Mint stamps cannot exist therefore. It’s been a long time since my last post,but despite my silence the keyplate world has been wild and roaring! 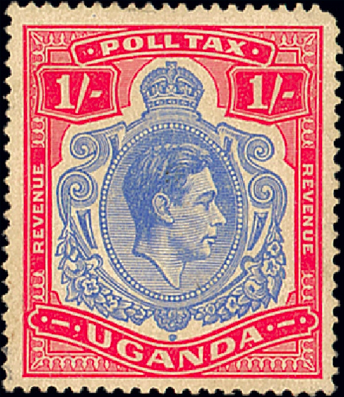 Spink held a one of a kind “Important Revenues of the British Empire” sale which featured many rare and unique keyplate items,including proofs,specimens and documents.My favorites being the Kenya and Tanganyika Kodi stamps used on complete cards and some of the most obscure of all the keyplate issues,probably the rarest of them all,the Uganda Poll Tax stamps.For sale were the proofs of the frames for the 1/- and 2/- values,an unused copy of the 1/- and a philatelically inspired cover bearing a 2/- stamp.It is worth reminding that only two copies of the 1/- are recorded and six of the 2/- including two mint and the copy on cover.I will post some pictures of these for you all to enjoy! !